The Runner's Lounge topic this week was especially relevant because I'm thankful for running for one huge reason (pun intended): the ability to eat food I like. Since Thanksgiving is soon upon us, it brings me to one of my true loves: food. 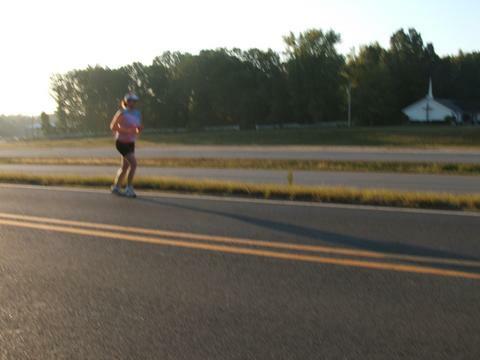 Sure, there are other reasons I love running so much and am very thankful I can do it. It de-stresses me and allows me to think through problems while still burning calories. But I really love it because I really love food. All of the experts tell you that you shouldn't live to eat, but eat to live. Yeah, I never got that memo or I threw it in the trash. Truth is, I LOVE food and enjoy ordering and eating it. I don't eat deep-fried Oreos (pictured left) or anything along those lines (anymore, that is), but I do enjoy good food and that doesn't always mean it's low calorie or healthy for you. It also means that every once in a while I can indulge in unhealthy pizza or Chinese or cake or whatever and not feel guilty. I don't allow myself to do it much, but if someone offers a piece of cake and I want to have it, I let myself have it. I've earned that indulgence. Quite related, I'm so grateful for running because I'm able to look at myself in the mirror and be happy with what I see. I fit into clothes that I could never fit into before and I feel great about what I've accomplished. While walking started it for me, it was running that really took off the weight. It's a life-long process, but I'm glad to say that running will continue to stay with me for the whole way. This was written as part of the Runner's Lounge: Take It and Run Thursday. This week's topic was "Thank goodness for running day". 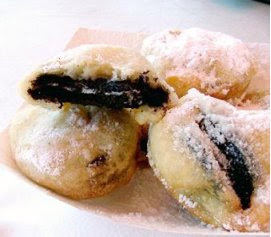 Deep-fried Oreos?! I don't know if those look/sound delicious or disgusting. I always wondered how they deep fried oreos...and how anyone could possibly eat them without getting sick. I've never heard of deep fried oreos! Glad running has given you more enjoyment in life. Being raised by Japanese parents, I think the most decadent thing I ever had growing up was sashimi (raw fish) and sushi. We didn't eat much meat, cheese, fried foods or sweets at home and rarely ever ate out at a restaurant. On special occasions, we got fresh sashimi (raw fish) and sushi that my mom made, even on Thanksgiving. YUM!!! I am with you... I always eat these huge plates of pasta, and voila: Thanks God for running!!!!!! !